Therapeutic communication is such a huge part of Nursing that test writers often include questions about it on the National Council Licensure Exam. Of course, it’s just as important in Medical Assisting, where you’re working with people in ambulatory care facilities. In any given shift, you encounter an array of emotions in the waiting room or ICU, some happy, some fearful and antagonistic. 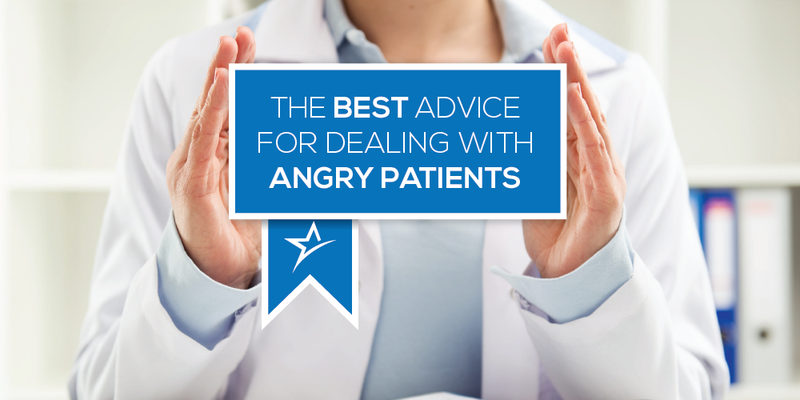 Whether you’re a Nurse or Medical Assistant, you’re going to encounter angry patients and their family members, so you need to know how to deal with them. This advice can help. When you’re a Nurse or Medical Assistant, you’re in a career where you work almost primarily with people who don’t feel well. Some only come into the clinic or hospital for a physical or to run blood work, but most patients are experiencing at least a little pain or discomfort. Either of these can breed fear, irritability, and distress, which often manifest as anger. You may have an entire shift where you only treat and deal with pleasant, polite people, but more often than not you’re going to have a patient or family member who’s upset—so you need to be prepared. Given that angry patients are a reality of the profession, prepare for them by remaining calm the moment you start your shift. Your own stress and frustration can exacerbate the situation, so remaining peaceful and collected can keep a situation under control, and sometimes diffuse it from the outset. You can also read a patient’s body language to anticipate anger. Clenched jaws and muscles, visible agitation, and sudden changes in behavior can all signal that a patient is distressed. Seeing and addressing this in advance can prevent anger before it manifests; at the very least it prepares you to expect an outburst. Sometimes patients and family members appear to become angry for no reason: One minute they’re friendly and chatting, and the next they’re distressed. There’s always a reason, whether it’s immediately apparent to you or not. Pain and fear can cause anger, but so can worry, and sadness. If they’re in the hospital, patients and their family members are often facing concerns and an array of emotions they’re not used to. Be patient and listen to them. Whether the anger seems irrational or not, whether they seem to be generally disagreeable or not, you can find empathy for their situation, and you need to show it. In To Kill a Mockingbird, Harper Lee writes again and again that people need to try to walk in another person’s shoes. To empathize well, you need to put yourself in your angry patient’s position, and imagine how you would be feeling with a broken arm or kidney disease or 104° fever. Angry family members are often just worried for their son, mother, or grandfather. If you can put yourself in their shoes, you’ll be more empathic about their situation, and anger, and so you can validate their feelings while addressing their specific concerns. If your emotions can exacerbate a fraught situation, your words certainly can too. Generally, it’s wise to keep your language personal: Use “I,” showing you’re hearing them, more than “you,” which can come across accusingly. Tell them you understand, and rephrase their concerns to demonstrate you really have understood. Ask open-ended questions that give them more opportunities to express themselves, and maybe reveal their real problem. Angry patients may direct their frustration at the Nurse or Medical Assistant, but with tactful language, you may be able to suss out the deeper, psychological cause of their emotion. If you remain calm, empathic, and tactful, you can often diffuse a situation with an angry patient, but not always. You can be a perfect Nurse or Medical Assistant, using excellent communication and providing the very best care, and still some patients will remain in a rage. While you always have to communicate therapeutically, that may not always appease angry patients or their families. That’s OK, as long as you’ve done your job well, a job that requires empathy, tact, and remaining calm, even in fraught situations. At Ameritech College of Healthcare we want to help our Nursing and Medical Assisting students be the best they can be, and prepared for every patient situation. Therapeutic communication is a huge part of our curriculum, since it’s so important in the healthcare field. If you any questions, please reach out. We’d love to hear from you.